Would you or a loved like more info about services keeping older or vulnerable people safe in Sutton? A free Community Safety Day for Older People is taking place in the Community Space Area at Sutton Central Library on Thursday 2nd August from 10am to 1pm. The day will provide elderly and vulnerable people across the borough with information about the services and activities available to them and to help keep them safe. 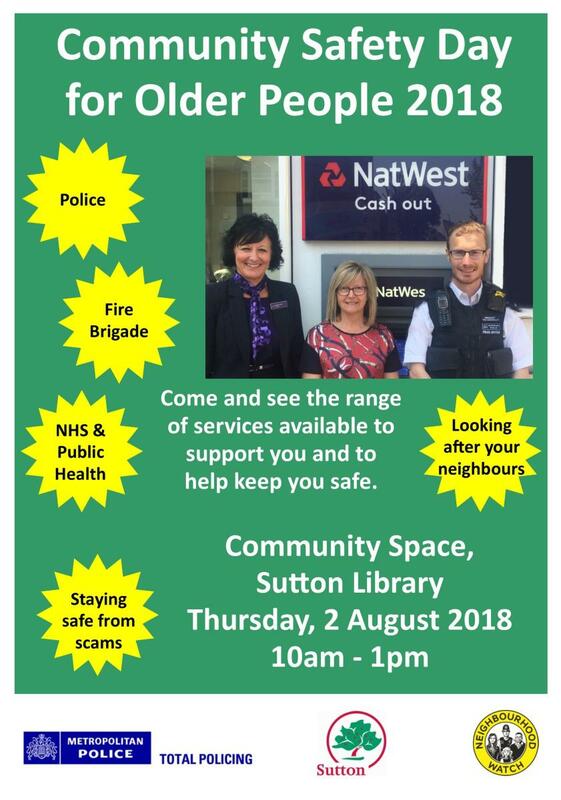 The event is organised by the Safer Sutton Partnership Service and Sutton Neighbourhood Watch Association - supported by Sutton Council’s Libraries, Heritage and Arts Service. Around 30 other organisations, including Sutton Housing Partnership SHP and our Sutton Connect service will be attending the event, which last year saw upwards of 1,000 visitors. The event is free to attend and will include a chance to meet with members of the police, fire brigade, SHP and other key partners. We hope to see you there! There has been a continuous presence on site by SHP staff since the fire, and this will remain in place for the rest of the week as things return to normal. Our staff have been working closely with the fire brigade and our team of electricians and fire safety experts to assess the damage to each property, and take every step necessary to get residents back home safely. We’re supporting everyone who experienced the upheaval of not being able to return home as a result of the fire, and will continue to support everyone living in Chaucer House with day to day help and reassurance. Emmanuel Olukotun, Housing Manager for Chaucer House and the surrounding area, will be based at Milton House from 9am to 5pm until Friday to receive any enquiries from residents. The building's regular caretaking team will be available from 6am to 4pm, with additional caretaking cover from 4pm to 10pm and fire safety patrols from 10pm to 6am continuing throughout the week. We will be running a drop-in session for residents from 5pm on Wednesday 25th July at Milton House. You are invited to attend the drop-in and speak to us about Friday’s events, fire safety or any other concerns you may have. This will be followed by a meeting of the Chaucer Residents' Association at 7pm, also at Milton House. This will be attended by residents’ association representatives and SHP. If you have any concerns, please speak to a member of SHP staff or call us on 0208 915 2000. You can also contact our out of hours service on 020 8770 5000. Update: read a further statement from Cllr Jayne McCoy, Deputy Leader and Chair of the Housing, Economy and Business Committee, London Borough of Sutton. We can confirm that there was a fire at Chaucer House earlier today (Friday 20 July). The fire did not spread and was not related to the cladding of the building. No injuries have been reported, though two adults were treated for smoke inhalation. The building’s communal fire alarm worked as it is designed to - which is to alert the fire brigade and not to sound in all flats. The sprinkler in the flat was triggered and worked effectively. The fire was fully extinguished by 11.30am. Steve Tucker, Managing Director of Sutton Housing Partnership, said: "We're enormously grateful to the fire brigade and the emergency services for their response to the fire at Chaucer House. "Thankfully, the fire was contained and no one was injured. Our main concern now is making sure residents continue to get the support they need. "We are hopeful that everyone at Chaucer will be able to return to their homes later today, but we are working with our partners to ensure temporary accommodation is available should anyone need it. "Our staff will stay at Chaucer this afternoon and this evening as we work with LBS and the fire brigade to provide information and reassurance to anyone affected. Residents affected by the fire can come to Milton House, where tea, coffee, food, milk and nappies are available and staff are on hand to provide support." The Leader of Sutton Council, Cllr Ruth Dombey, said: "Thankfully there were no injuries and the fire was contained to one flat and did not spread. The sprinkler system worked very effectively to contain the fire. "Our huge thanks to the fire brigade and emergency services for their rapid response. "A meeting was held earlier this afternoon with representatives of London Fire Bridge and Sutton Housing Partnership in order to reassure residents and provide support. "We are hoping that everyone will be back into their properties later, but are preparing temporary accommodation and general assistance for a small number of residents. "Fire investigators are working to establish the cause of the blaze but it was not related in any way to the cladding system." The SHP New Deal is our commitment to deliver high quality landlord services and homes in good neighboods, while you do your part to look after your home, be a good neighbour and work with us to build thriving communities. 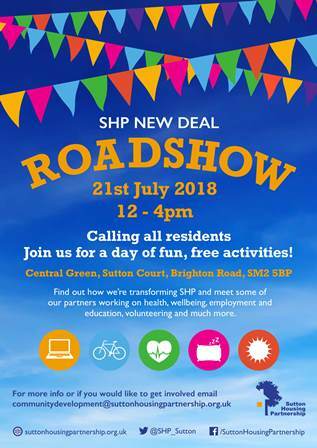 Join us on 21st July from 12 noon to find how we are transforming Sutton Housing Partnership and meet some of our partners working on health, well-being, employment, education and more. Want to keep up with the latest news from SHP? Follow us on Twitter and Facebook. 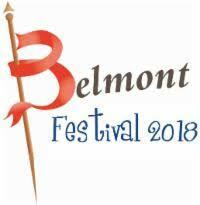 The Belmont Festival is back! Belmont Festival is back! With over 100 stalls, products for sale, prize draws, live music, street food and fun for all of the family this years festival will be worth attending.